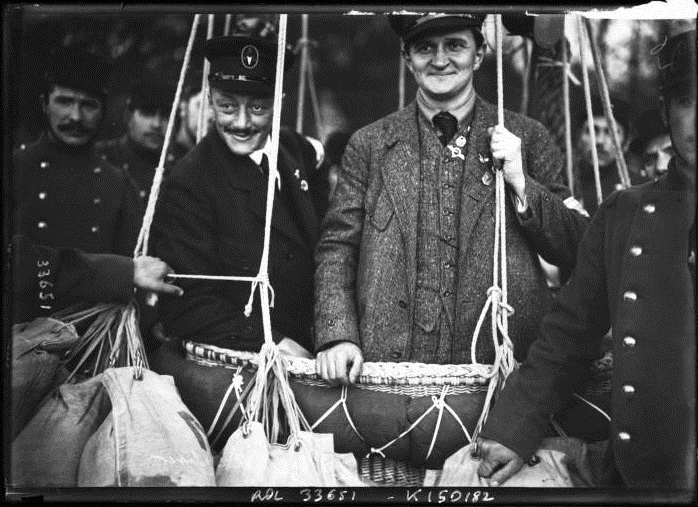 8–11 February 1914: Aeronaut Hans Rudolph Berliner and two others, Alexander Haase and A. Nicolai, departed Bitterfeld, Germany, aboard Berliner’s gas balloon. They were carried across the Baltic Sea and into Russia. After encountering rain storms, gale force winds and howling wolves, their balloon came to rest in deep snow near the town of Kirgischan in the Ural Mountains. In 47 hours, the men had traveled 3,052.7 kilometers (1,896.9 miles), setting a Fédération Aéronautique Internationale (FAI) World Absolute Record for Distance.¹ This record remained unsurpassed until 1978. Hans Berliner’s balloon was described as being spherical and painted yellow. It had a volume of 2,250 cubic meters (79,458 cubic feet) and was inflated with hydrogen. Prior to this flight, the balloon had made more than 50 ascents. German Pilot Berliner Reached a Point in the Ural Mountains. BERLIN, Feb. 16.—The German balloon pilot Hans Berliner, who ascended with two passengers on Feb. 8 in his spherical balloon, telegraphed to-day from Kirgischan, in the Ural Mountains, that he had landed near there after a forty-seven-hour flight from Bitterfield. The flight, it is understood, broke the distance record but not the duration record. Berliner had been unable to reach a telegraph office until to-day. The flight of Berliner’s balloon extended considerably further than that of Dr. Korn, who, after ascending last week at Bitterfield, landed at Krasno Ufimsk, 110 miles southeast of Perm, Russia. —The New York Times, 17 February 1914. The Russian government charged the three Germans with espionage and sentenced them to six months solitary confinement and a fine. They were released on 8 May 1914 and allowed to return to Germany. The balloon was also returned.